Clarify 2Additional ResourcesDOCX (Word) Templates IntroductionHow is a DOCX template structured? 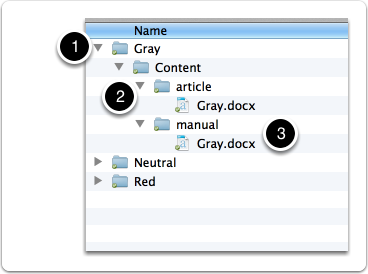 Here is the structure of a DOCX template folder. The root folder is the name that will appear in Clarify. The DOCX file that will be used for exporting your Clarify documents goes in the ./Content/article folder. The name of the DOCX file is irrelevant. All that matters is that it have a .docx extension. A DOCX template can also have a ./Content/manual folder. This is not used in Clarify but can be present since Clarify DOCX templates use the same format as ScreenSteps DOCX templates. Prev: Where do I put custom DOCX templates? is this article still valid? on OSX 10.10.5 Clarify 2.0.5 build 4 is folder empty and added templates are not recognised. @brano - Yes, the article is still valid. The folder is empty by default as you haven't installed any custom templates. I would suggest sending a screenshot of what you added to the folder to support@screensteps.com. My guess is that you just need to modify the folder structure as Clarify isn't find the actual .docx file in the right place. @RF Try selecting the [[SCREENSTEPS_ARTICLE]] text in your document and removing all styles from it. I've seen this before when a style gets applied to part of the text and the text ends up being split up into multiple segments internally within the Word file.